Over the years I've seen many players taking a break or even stopping completely with playing chess. Everybody has their own reasons but a crucial role plays surely the diminishing or even the disappearing of the game fun. 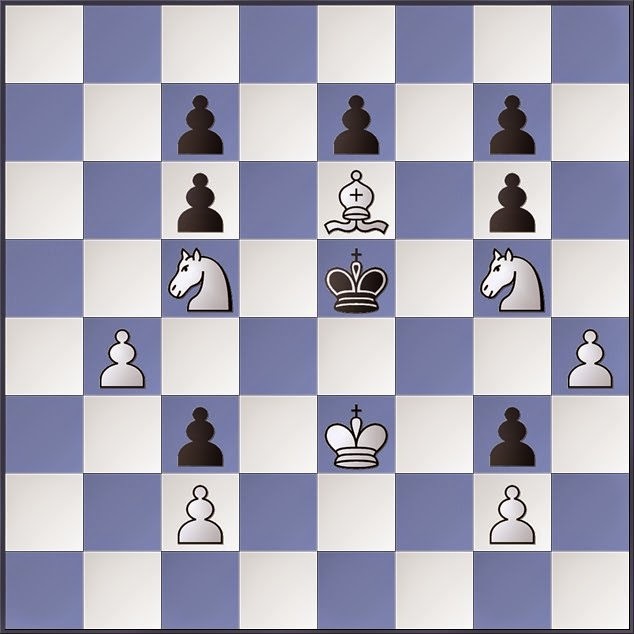 I am convinced if somebody really likes to play chess then this is always possible in a moderate format on the condition that priority is given. So game fun is very important and that also is valid for myself despite the fact that I adopt a scientific approach. Winning is fun but losing is often very painful. Earlier I wrote in my article practical endgames that I was devastated after my loss against Bart. So chess is full of emotions for real adepts. Emotions aren't only present after the game but also before (remember the stomach-problems which I described in my article the sadistic exam) and especially during the game. Of course while playing it is smart to ignore emotions so full concentration can be given to the position but this is easier said than done. Especially when players get into time-trouble and on top have a difficult position on the board then some weird tics are seen. Swarming on the chair, stamping on the floor, clicking with the pen,... are undeniable signs of tension. Calmly leaning backwards in the chair shows the player has everything under control. A red turning face on the other hand indicates the player likely made a mistake. Myself I am surely not immune for this but I do try as good as possible to hide my emotions so no useful information is shown to my opponent. So when I blunder then I pretend that it is part of the big plan as last in my simul-game against Niels Geryl so not to give my opponent a boost of self-confidence. By the way that time my poker-face didn't work as Niels skillfully finished the job. Sometimes I do salvage an extra half point like in my game against Marc Moors mentioned in the article the favourite has hundreds of points more. Showing signals or not possibly influences opponents. Rick Lahaye wrote an interesting article on chessbase about how we can manipulate the focus of the opponent. You look deliberately to the wrong side of the board to let the opponent believe there is the action. This mainly works against much weaker opponents as they often assume that the much stronger opponent surely understands the position much better. An other familiar sign is to glare so that the opponent feels uncomfortable and as consequence can't concentrate properly. Very unsportsmanlike is to fake a blunder so the opponent fells in a trap. However I have to admit that online I dare to be less mister nice guy as this faking of a blunder i regularly apply with amusement if I can play my spectacular novelty in the Kan. I explain as I expect readers are wondering how it is possible to fake a blunder in online-chess while you can't see each other. Playing with the reflection time was already once covered in the article camouflage but this time I didn't hide a preparation but tried to provoke a blunder. The border-line between psychological war-fare and disturbing the opponent is vague which also became clear from the comments on an article of schaaksite. Recently I encountered a debatable experience. In the second round of Open Gent I played against Martijn Maddens. We jump at move 29 at the moment that Martijn proposed a draw. It is normal that I was shocked by my "stupid" blunder but my emotional reaction was too strong and therefore doubtful. Martijn even started to laugh when I kept on shaking my head. Afterwards he told me that he was misguided by my reaction. Martijn believed that I was disappointed because the draw was inevitable and not because I missed the direct win (which I urgently wanted to show him after the game). Possibly Martijn played because of this less concentrated as in the follow-up the position was spoiled despite the big time-advantage and the clear drawing-chances. I suppose many readers would've also missed the winning combination when being short of time so do find my reaction exaggerated irrespective of the ethical aspect. However one should not forget that in the past I was involved in chess-compositions. The mate-pattern is a very known theme in chess- compositions namely the starflight of which I made a composition 21 years ago myself. The king can only escape in the solution to the diagonal neighbouring squares so like a star. The missed combination was only a 3/4 starflight so normally easier to calculate. When the king can only escape to the horizontal neigbouring squares then we talk about a crossflight. An example of a crossflight was covered in the earlier referred article chess-compositions.